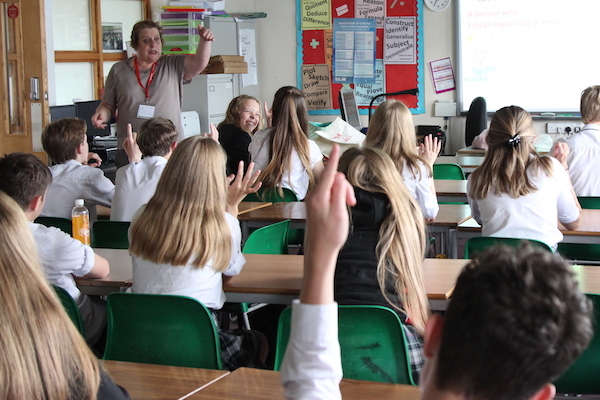 Form the Future recently ran its first event at Saffron Walden County High School, where more than 300 Year 8 students had the opportunity to create exciting, new business ideas at our Enterprise Day. The Enterprise Day is a popular event that we hold in schools to give students a taste of entrepreneurship and business management. The students were challenged to work productively together in teams to develop a brand and business plan for their product or service. 15 business volunteers from a range of industries were brought in to lead each team. They also formed a Dragon’s Den-style judging panel that the students pitched to at the end of the day. Certificates were awarded in recognition of the students’ achievements, with special awards recognising teamwork, presentation skills and creativity. An amazing variety of business ideas were proposed during a brainstorming session, with the final refined ideas including a treadmill for dogs, an online GP surgery and a clothing brand for teenagers, which won the award for the Most Innovative Business Idea. This type of event allows the students to get creative whilst developing the skills needed to run a successful business. Valuable employability skills such as leadership, communication, organisation and time management are also transferable across different job roles and industries. Our in-school events also give business professionals a fantastic opportunity to give something back to their local community and help us in our mission to prepare the next generation for their future careers. The students completed surveys at the end of the event to provide us with valuable feedback, so that we can assess the impact of our interventions and continually improve our services to schools. As a result of our Enterprise Day, an incredible 91% of students said they were more comfortable working in a team and 90% said they were more confident to come up with creative ideas. After pitching their business ideas in front of their peers and the panel of judges, 74% of students felt they had improved their presentation skills and confidence to present. If you are interested in taking part in running an Enterprise Day in your school, or would like to take part as a business volunteer, please contact our Events Manager, Mariana Soberón at msoberon@formthefuture.org.uk or on 01223 781296.